I found it helpful to transfer the BUPA schedule onto my own table and colour in a day when it was done. 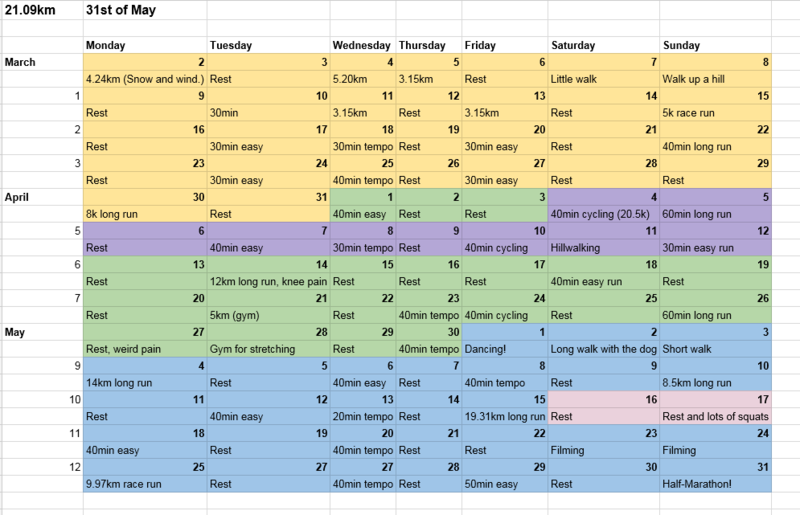 However, some days I wasn’t able to follow the schedule exactly, so the completed table shows the times/distances I actually ran (because rather than not colour in that day I chose to cheat and alter the distance/time I was meant to run). I went on holiday twice during my training period, one trip (purple) to Austria for Easter and one trip (pink) to Amsterdam with some friends. While I managed to run and do some cycling and hiking while I was home for Easter, I moved my longest run to the day before my Amsterdam trip. I mention this because I kept the schedule fairly flexible while still trying to hit the targets. During the week, I trained at the gym before going to work. I figured out that I could do 7k in the 40 minute default setting at the treadmill, so I usually got up at about 7:30am, had a banana and/or peanut butter and jam on toast for breakfast, walked to the gym and did my training while watching Charmed/90210/Made in Chelsea/The Goldbergs. I start work at 9:30am and my morning office isn’t too far from the gym, so I could slurp a chocolate milkshake for recovery (and deliciousness) on the way there. On the weekend, I still preferred the gym to the outdoors, mainly because my knee pain had started while running on the road and stopped on the treadmill. After a long training run during my lunch break (I finish my first job at 1:30pm and start in a different office at 4pm) I had a horrible headache, so when it got to my longest training run of over 19k, I wanted to make sure I wouldn’t get dehydrated. I brought a litre bottle of apple juice and water and some sugary love hearts to have at regular intervals, which definitely helped. I alternated between running at 9 and 9.5k/h, and the steady change in pace as well as the TV shows definitely kept me going. Mentally, I pulled myself along by remembering that I could do 7k in 40 minutes, and I only had to do that 2.7 times to hit the target. I got exhausted at about 14k, and I reminded myself that I didn’t have to run fast, I just had to run and hit the number. Those long runs, in combination with the many shorter, easier runs, definitely helped build my endurance. 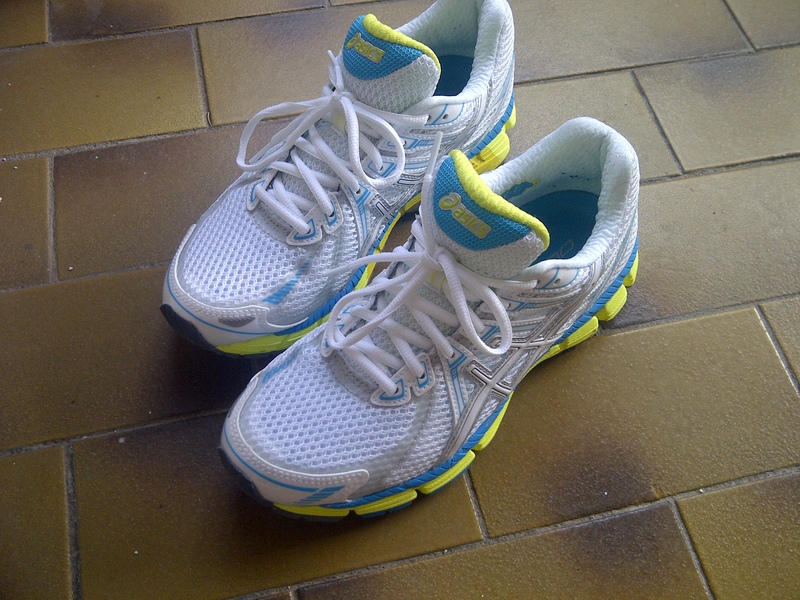 My favourite runs were the interval training runs, which were hard but steady and doable. 2 minutes of moderate running (at 9.5 or 9, 0 elevation) followed by 1 minute of hard running (9.5/9, 4 elevation). The fact that they didn’t last for too long (only 40 minutes at a time) meant that they were exhausting, but absolutely achievable, and they definitely helped me build my strength. In the week leading up to the big race, I felt really excited. I had been sharing my fundraising page all around and exceeded my target by a lot – and then a bunch of my colleagues at my evening job chipped in, relatives from home and friends from far away contributed, and I hit £660 just before the big run! Knowing so many people believed that I could do this was a huge motivation, and I am very grateful to everyone who donated and supported me. The day before the half marathon, I ate as many carbs as I could. All the carbs in sight. Sandwiches, toast, pasta, potatoes, garlic bread, cake. I also drank lots of water. All the eating and drinking and talking about THE RUN made me even more excited, but also very nervous. While I definitely felt prepared, the weather warning of rain and wind didn’t sound too great, and I was scared I would fall and hurt myself or get dehydrated. I couldn’t sleep a lot either, I was really hyper and anxious I would miss my alarm at 6am. But I didn’t. I woke up, ate a banana and some toast with peanut butter and jam, and drank two pints of water. I’d already packed my race bag the day before and cut a bin bag into a stylish strappy dress to keep the rain off me as I waited to start. My friend Sophie was visiting from New Zealand, and together we walked to the starting line of the race on Regent Road. I dropped off my bag, and Sophie and I waited at my pen for the race to begin. Sophie could tell I was anxious, so she showed me lots of pictures of dogs on her phone, which helped. The pens filled with people in colourful shirts and fluorescent trainers, and together we all hopped around until the race started at 8:05am. We were in the pen which was the furthest from the starting line, so we had to walk for a little while until we could start running properly. At this point the rain had turned into an easy drizzle, which felt good. After a slow jog, I settled into an easy pace on the slippery road. My friend Kate waited for me a mile after the start, and I stopped to hug her and zoomed off afterwards, with that bit of extra motivation that made me want to overtake as many people as I could. I found a steady pace behind another runner who seemed to be going at the same speed as me, but after about three miles I got a stitch and stopped to stretch until it subsided. I found my speedy running partner again in the crowd, and ran again until I’d caught up with her. I had no idea who she was, but she kept me company for another couple of miles, when I lost sight of her. I passed people, then they passed me, and it was never boring. I would pick out someone far ahead of me, perhaps someone in a particularly bright shirt, and try to catch up with them and overtake them. We got to the beach, and it was a stunning sight of dusty blue under grey skies. Six miles. Six? I had thought we’d been going for longer than that (but then, I’d also trained in kilometres, so the only thing the marker told me was that we were almost halfway there, halfway to 13.1mi). People on the side of the road were waving, busking, handing out water, jelly beans, and high-fives. Other runners around me sang “Living on a Prayer”. I finished my bottle of isotonic sports drink and tossed it into the growing piles of little bottles, half-finished, discarded by everyone around me. Finally, we left Portobello, and got to a bit of road I had never seen before. I got very excited. Someone outside a house played the “Chariots of Fire” song, and the speakers across the road blasted “500 Miles”. I did a lot of waving and smiling at strangers. Welcome to East Lothian. Welcome to Musselburgh. How much further? The 8 mile mark. Someone next to me checked his watch and said, “It’s 10am”. Had we really been going for two hours? I felt okay, but I was worried I would be slower than I’d hoped. I hadn’t really been running very quickly, just at a steady pace, because I didn’t want to get too tired and have no energy left for the final stretch. Finally, we reached a bit of road with spectators, cheering, and I realised they were cheering for the final bit of the race – which we hadn’t reached yet, but those about to finish were coming towards us on the other side of the road. A big truck with speakers played music. How much longer until our trail loops back on itself and leads us to the finish line? Some volunteers from the charity I was running for saw my running vest and called out to me, and we waved at each other and smiled. Nine miles. Ten miles. My left leg started hurting, my knee wasn’t very happy. I knew it was the unfamiliar hard surface, and I was angry with myself for not having trained on the road more. I switched to the grass next to the road, but it didn’t help. I had to pause. I stopped, walked, stretched, and tried again. It wasn’t great, but I was able to keep running. Finally, the bend. We ran around a traffic cone and were on the other side, the side of the road that led to the finish line. More water, more energy gels that tasted of viscous jelly sweets and put a spring in my step. Eleven miles. Two boys in yellow vests passed me, and I clocked on to their shirts, thinking, “These are my new pace makers.” They were fast, and together we overtook a few other runners. Twelve miles. Someone on the side of the road handed out jelly babies, and I stopped to take one, lost my high-viz friends, and found them again. The charity I ran for called out to me again, and I ran over at full speed to high-five one of the volunteers. I believe someone took a picture of that moment, which I’m sure is unflattering but also very cool. Home stretch. People on the side of the road were cheering, and a woman called out and told us we only had “POINT TWO OF A MILE TO GO”. Was it that close? There was a bend in the road, and people cheered. Three girls in front of me, running, held hands and laughed. Thirteen miles. I saw a sign up ahead that said FINISH. I sprinted. I squeezed past the two boys in yellow, lengthened my stride, and leapt forward. The ground was slippery and I didn’t want to fall, but I wanted to get there as fast as I could. The clock said 2:47:00, and I was disappointed, but also happy. Later, I got a text confirming my actual time, 2:28:03. But it didn’t matter. I drank a lot of water. I picked up my bag. I bought a pizza. I put on five layers of clothing sitting under a tree. My charity’s volunteers fed me tea, wrapped me in blankets and massaged my legs. I called my friends. I sat in the grass, the sun came out, and I was tired. But really really happy. My boyfriend’s parents arrived, and together we cheered and cheered at the finish line until my boyfriend and his friend appeared, having just completed double of what I had ran, 26.2 miles (or 42.195 kilometres). It was a fantastic day, and really well organised. I read somewhere on the internet that I should wait for a week until I declare that I’ll NEVER RUN AGAIN, or enter into another race. But my feeling is that I will do it again (in fact, I sort of promised I’d do the Cardiff Half Marathon in October with my boyfriend’s sister), because the training was well-structured and had achievable goals and I want to see if I can do it faster, and do it without getting an achy knee. Tags: bananas, breakfast, carbs, eating, Edinburgh, experience, gym, half marathon, jogging, marathon, nutrition, personal, running, toast, training. Bookmark the permalink.